Matthew “Comrade” Linton has been going by the name ArtBiker for over 20 years. He is an artist, writer, professor, husband, father, and patch holder. He grew up in Albuquerque, New Mexico where the desert landscape, open roads, and big sky had a lasting affect. 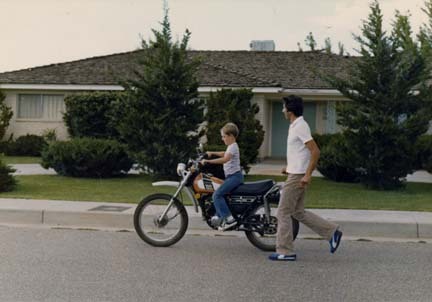 Growing up in the 80’s, Matthew was deeply involved with punk rock, tattoos, skateboards, and motorcycles. Upon graduating high school in 1988, Linton went on to attend Arizona State University where he received his Bachelor of Fine Arts degree in Photography. It was in Arizona that Matthew became steeped in motorcycle culture. Past were the days of motorcycling being something in which he took part. The culture gripped him and motorcycling became who he was. Linton moved from sunny Arizona with its year round riding to Boston, Massachusetts where he attended Tufts University and The School of the Museum of Fine Arts. There he earned his Master’s Degree in Fine Arts and Visual and Critical Studies. He began teaching photography his last year in school and ran the Photography Department at the Boston Architectural Center (an accredited architecture and design college). Eventually the cold, long winters got to ArtBiker and he packed his things and moved to Bellingham, Washington where the taught photography as a visiting professor. Things at Western Washington University were fantastic, but the weather was still a bit wet for Linton’s taste. So, he took a tenure track position at the University of Houston- Clear Lake and has set roots down there. He is now a tenured Associate Professor of Fine Arts and runs the Lens Media Program at the university. Matthew is married to a wonderful woman named Dayna (aka Big Mamma) who shares his passion for motorcycles and the biker lifestyle. She is not just a supporter, but also a rider herself. They have two beautiful baby girls and a wonderful Black Lab Mix puppy. The girls share their parent’s love of motorcycles and jump at the chance to take a ride on the tank or in a sidecar. The puppy, however, is still a bit gun-shy from her days growing up in the pound. She will chase Matt or Dayna as they ride down the street, but has yet to jump into a sidecar and go for a spin.